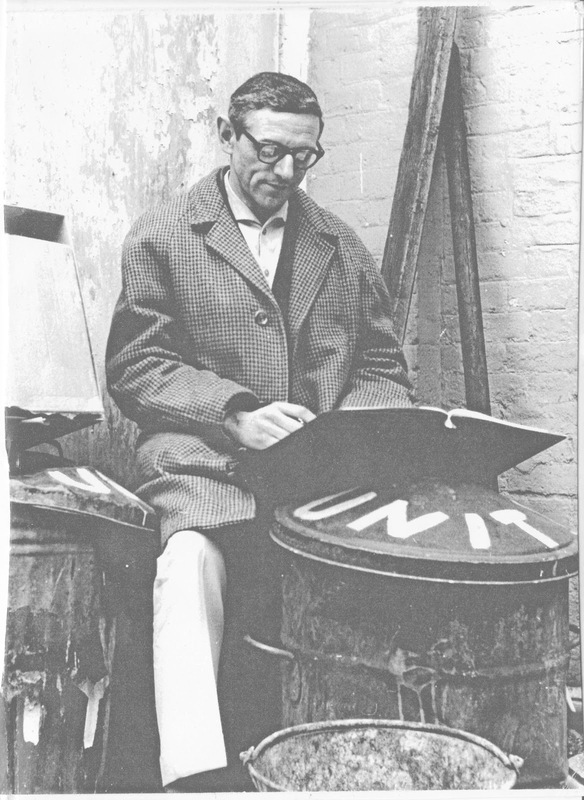 There is a photo of my father in my kitchen, it shows him in the early fifties of the last century (or sometime round then), sitting amidst a set of rubbish bins (garbage cans if you're American) reading a script. The bins say "Unity". A friend admired the picture and asked where I had bought it. She said she wanted a picture like that for her house, so I told her that it wasn't bought, it was a picture of my father, Heinz Bernard, who was then the manager of a communist party affiliated theatre in London, called Unity Theatre. Needless to say she hadn't heard of Unity but when I told her that he had appeared in two legendary Israeli Educational TV series, Neighbours and Here We Are, she immediately knew who he was. In the late 'Seventies and 'Eighties there was only one TV channel in Israel and each of the two series was shown twice a week. They were so popular that they were shown for seventeen years. Long after Israeli TV broadcast in colour, the two black and white series were still being shown. That was a age before "celebrities" - many of them people who are famous for being famous - but Heinz, (my father), could not walk down the street without being recognized, and sometimes being mobbed by children. Very few knew his name, but the entire country knew who he was. In Neighbours (which was written by my mother), he was "Mr Cohen" and in Here We Are, he was "Dr Sharoni". Heinz wasn't the only former leftist or top-flight actor in the two series. Peter Frye, who played "Mr Kashdan" in Here We Are, had fought in the Spanish Civil War. Sarah Amman, who played the doll "Susie Surprise", had been a dancer on Broadway, and the director, Maxine Ellis, came from Beverly Hills, and was the widow of a Hollywood director who had been blacklisted by McCarthy. Thelma Ruby, who played Bella and was coincidentally married to Peter Frye, went on to have a successful career in the West End. The music, which remains popular, was a key component of the success and was written by a former employee of "Sesame Street". What a surprise! I didn't expect to find this photo on the internet! You perhaps didn't know that the script he's reading is for the play "The Scavengers" by Arthur Adamov (original title: "Le politique des restes"). That's why he's sitting among the dustbins. This is Michael Schneider. I also have a picture on my desk of Heinz and myself in "The Best of Sholem Aleichem" in which we performed together with Eliahu Goldenberg through the '70's and as a duo into the 80's after Eliahu died. I would like to hear from you perhaps on Facebook if you feel like it. Michaelk, both me (Jonathan) and Anna are on Facebook and you should look us up. So far I haven't managed to locate your profile. Nettie still has one of those photos too and would love to hear from you. Michael, how unexpected to hear from you after all this time! I just looked for you on Facebook, but it seems Michael Schneider is a remarkably popular name, and I didn't recognize your photo. Maybe you'll have better luck looking for Anna Lowenstein. I'm the one sitting in a rocking chair reading Harry Potter. Good heavens, this is a real gathering of old friends on Jonathan's blog - first Michael Schneider (who did a double act with Heinz in Tel Aviv) and now you. Are you on Facebook? I've got some nice photos of Nettie in the garden on my Facebook page. There's a great shot of that magnificent thistle in the foreground! Nettie told me she's going to see you in Brighton. Have a good time!